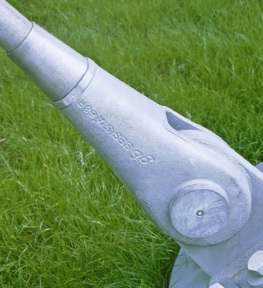 Galvanizing of castings is covered by EN ISO 1461:2009. Hot dip galvanizing of cast iron provides excellent protection from corrosion and the coating is applied by immersion in molten zinc at 450°C forming a tough, adherent coating which is bonded to the base metal by series of zinc-iron alloy layers overlaid with free zinc. If any problems are experienced with hot dip galvanized castings, they can usually be tracked back to the surface condition on the casting. Causes include burnt-on moulding sand, oxides from the annealing process, traces of graphite or pollution, or surface flaws such as shrinkage holes. Cast iron is a compound of iron and carbon usually with a carbon content of more than 2% and silicon and phosphorous levels significantly higher than in normal steel. The composition of the cast materials must be taken into account when considering galvanizing as a method of protection, especially the silicon and phosphorous contents. Cast steel is often used when design considerations point to a casting as the best answer but superior tensile strength is required. The chemical composition and properties of these castings are essentially similar to steel sections. Therefore, the preparation and suitability for hot dip galvanizing are the same. Iron castings of any type and any chemical composition can be hot dip galvanized. The term covers a wide range of ferrous alloys usually containing more than 2% carbon and from1-3% silicon. Wide variations in properties can be achieved by varying these elements and additionally alloying with various metallic and non-metallic elements plus casting and heat treatment techniques. Grey Iron Castings: Grey iron has a carbon content of greater than 2%, the majority of which is graphite in flake form. Spheroidal Graphite (SG) Castings: Similar to grey iron in composition but with carbon present principally as graphite in spheroidal form caused by the additions of magnesium or cerium. Conventional hydrochloric acid based pre-treatment for hot dip galvanizing of steel does not remove moulding sand deposits, temper carbon or graphite from the surface of cast iron. The necessity of sound preparation by grit blasting is crucial. Surface flaws such as shrinkage holes should be filled in prior to galvanizing, otherwise problems may ensue. Care needs to be exercised in the design of cast iron sections. Small castings of simple shape and solid cross section (e.g. levers, clamps, bushes etc.) do not present any problems for galvanizing providing that the material and the surface condition are suitable. Larger castings should have a balanced design with uniform sectional thicknesses to avoid distortion and thermal stress cracking. Always use large fillet radii, large pattern numbers and avoid sharp corners and deep recesses. The rough surface finish which castings tend to have may result in thicker zinc coating than on rolled components.